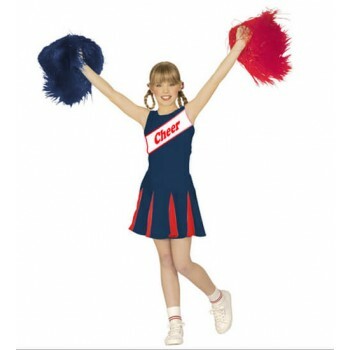 Channel cheerleader pride with our set of outfits here at School girl fancy dress ideas. Spunky and filled with school cheer, our Sporty Cheerleader costume will get pompoms a waving and crowds floating when your little one recites a cheer! The upper part of the dress is done sleeveless style with a high circular neckline. The Skirt is pleated in contrast colors of navy blue and red. A white logo stripe flashes diagonally across the chest encouraging everyone to “Cheer!”. The font is in cursive embroidered in red, the pompoms are also opposite colors, red and blue, and will inspire students to participate and show school pride. 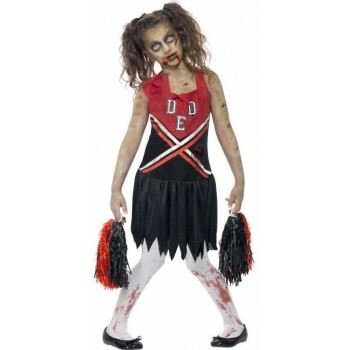 For more School girl fancy dress ideas try the Zombie Cheerleader look. Apply the Zombie Face paint and transform the peppy Cheerleader into a flesh seeking monster.